IQTELL’s virtual workspace: productivity heaven? This post, dear reader, commences as a tale of mystery. A dark tale of late night tweets and skype calls across the continents. It all started with a tweet inviting Ozengo to become a beta tester for something called ‘IQTELL’ and proposing ‘a private session’. Now Ozengo knew about cold calling, but was new to the world of cold tweeting. Or should that be #coldtweeting? Anyhow, Ozengo’s curiosity was piqued sufficiently for him to fire up his trusted mac to unleash some serious research upon this whole IQTELL proposition. It turned out that the IQTELL crowd claimed to have developed ‘a single, fully integrated application that allows you to manage all your needs‘. Ozengo’s initial response was one of scepticism. Most things that sound too good to be true are just that. However, it being a cold and rainy saturday morning in Melbourne, Ozengo looked further afield and came across consistently positive comments about this fledgling beta on user forums. Could this be true, a browser-based application that provided integration with your email, calendar, contacts and Evernote? That was steeped in David Allen’s Getting Things Done® (GTD®) methodology and fully customisable? Zendone is an elegant new productivity app that provides seamless integration with evernote and google calendar. It is so new, in fact, that it is still in beta; the version I tinkered with was 0.7.5. Setting up your zendone account involves providing an email address and creating a password. You are then ready to use zendone as a straight task manager. The multiplier effect for this app, however, comes from combining it with evernote and google calendars. Preparing your evernote account for zendone integration involves setting up a default folder in evernote called ‘@inbox’ and another one called ‘archive’. 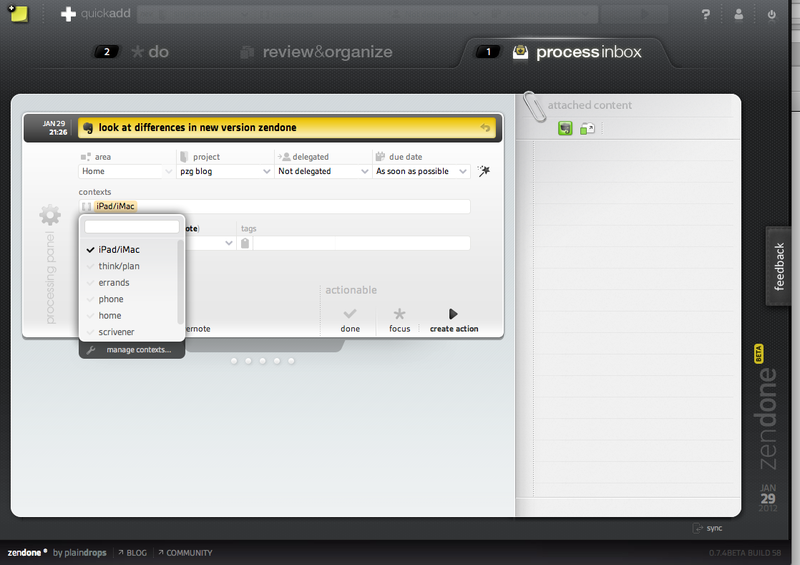 The zendone preferences pane and some preloaded ‘tutorial tasks’ guide you through this process. Zendone also creates new calendars in a nominated google calendar: one for each area of responsibility (e.g. work, home) and one for completed tasks. 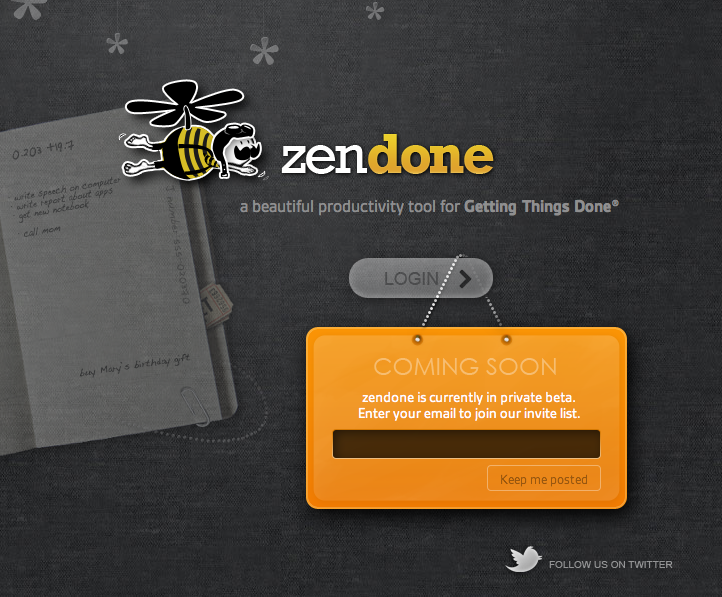 Any tasks that you create in, or email to your evernote account, appear in zendone’s inbox within seconds. The inbox is where you collect and process your tasks. They can be delegated, allocated to a project and given a context, a tag or a completion date. The user interface is clean, elegant and logical. A limitation with how you describe tasks is that the repeat function at present only provides ‘every‘ as the frequency option. I would also like to see an option to restart a task from its completion date (you make a mortgage repayment every month but you may decide to clear your gutters after three months). There is also no option to enter task duration (like in omnifocus or toodledo); and the absence of that parameter means that you cannot bring up a list of brief tasks (though creating a context for these could be a workaround). The zendone team appears to be thorough and responsive and I hope that these minor issues can be addressed in the final version. The next phase in David Allen’s Getting Things Done™ (GTD)™ process involves reviewing and organising your tasks. 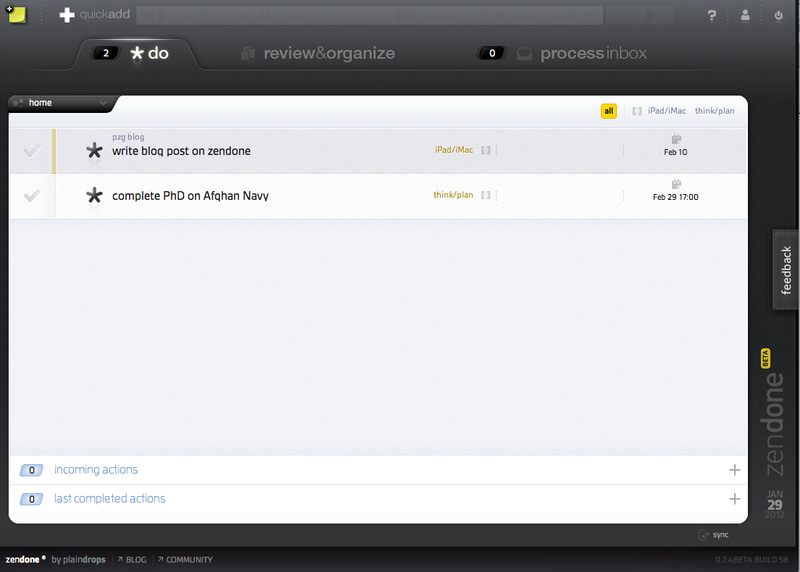 In zendone, new tasks are added at the bottom of the respective list. I could not find an option to sort tasks automatically by due date, but you can drag and drop them to sort them into an order that makes sense to you. The navigation pane can be hidden from view and you can click underneath a project list to show completed actions for that project. 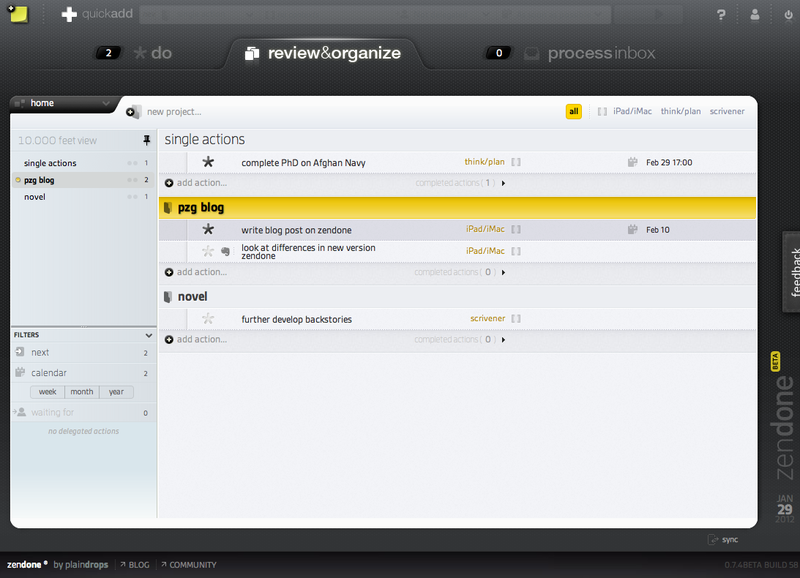 The zendone ‘review & organise’ pane. Note the filters in the navigation pane on the left. The main functionality I miss here is the capacity to have nested tasks (as in omnifocus, toodledo and todoist) and the capacity to save project templates or to schedule reviews (as in omnifocus). The ‘do’ view is again clean and uncluttered. You can choose to see all your priority tasks (marked with a chunky big star) or only those of a particular area of responsibility (such as work or home). You can also filter tasks by context. No demoralising sea of red here: overdue tasks have three discreet red dots in front of them. Two panes at the bottom of the screen can slide open to show recently received and/or completed tasks. There is much to like here and the app keeps getting better: the zendone team rolled out functionality improvements twice in the four days it took me to review the app and write this post. This is a great app if you want to add a productivity dimension to your evernote and/or your google calendar. Zendone is a delight to use even though its functionality is more limited than that of omnifocus. On the other hand, it is easier to pick up than OF. While omnifocus is fairly expensive to buy, zendone will not be a free app – there is talk about a ‘reasonable’ monthly fee. Personally, I find using a calendar for task management suffocating (but you can disable the evernote and google integration if you wish). The main dealbreaker for me is that zendone will only run on ‘a modern version’ of chrome, safari or firefox. For me, that means I would only be able to use the app at home. It won’t run in safari on my iPad 2 (OS 5.0.1) and at work the network is still using internet explorer 6 (mordac alert for all you dilbert fans out there). Finally, I just wanted to make clear that I have no commercial interest in zendone (or omnifocus) and that I am not an expert in productivity apps – just an interested user. And to you folks out there at zendone: congratulations on your achievement and please feel free to post a correction in the comments section if I have misrepresented any aspect of your work. zendone now has a fast and accurate search function. You can find more detail about these changes on the zendone blog.